Jacob Marvel is so excited at the treasure he just got that he finds me in the crowd to share the good news. 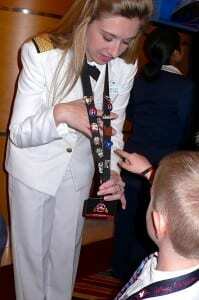 A Disney cruise officer trades pins with a young passenger. “I will never ever trade it. This is my favorite,” the 9-year-old declares, clutching a red-white-and-blue image of a Disney cruise ship. Complete with Mickey Mouse’s legendary ears, the ship looks as though it is sailing on a deep ocean with stars sparkling overhead. Pin trader extraordinaire, Jacob explained to me the intricacies of the popular pastime of Disney pin trading. But now that he has “the best pin of all,” the boy from Bloomington, Illinois, is happy to fasten the new pin to the lanyard around his neck. Smart boy. Jacob’s souvenirs are personally obtained from crewmembers, passengers, and ship entertainers. Pins also are for sale in the ship’s gift shop and pin trading events. On this particular evening, a special gathering features a pin exchange with ship officers outside the Walt Disney Theater. The way it works, Jacob says, is that two people eye each other’s pins on the lanyards around their necks. “You don’t touch the pins around another person’s neck,” he says. If you want a closer look, you should ask the person wearing the lanyard to hold it for you. “You have to trade for a pin they don’t already have,” Jacob says. Once the two parties agree, the trade can take place. Disney always offered collectible Disney pins in each of its parks. But, with the kickoff of the Millennium Celebration in October 1999 at Walt Disney World, the tradition of Disney Pin Trading really began. The fun is in the interaction between traders and the chance to find favorite pins. Guests of all ages hunt for beloved characters, attractions and features. Collectors sometimes wear their pins on vests, hats or fanny packs. At home, they may keep them on bulletin boards or in albums. Thousands of unique pins have been created by Disney over the years. Most of the pins are enamel or enamel cloisonné with a metal base. Some pines are available for only a limited time. Most pins cost $6.95 but limited edition pins and unusual pins – featuring a dangle, pin-on-pin, flocking, light-up, 3-D element or moving element – might cost up to $14.95 or more. Pins frequently are released at special events, movie premiers, pin trading gatherings or to commemorate the opening day of a new attraction. Some pins have increased in value and have reached prices of over $500 on eBay. Because there are so many Disney pins, collectors often narrow their search to specific kinds – either a character like Tinker Bell or Mickey Mouse, themes like sports or modes of transportation, or the popular Disney princesses or Disney villains. 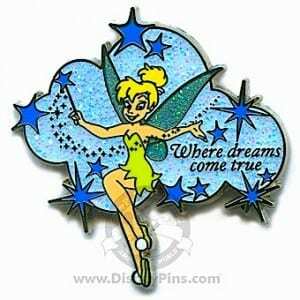 On a lovely pale blue background, the pin shows Tinker Bell waving her wand to spread pixie dust. “Where dreams come true” is inscribed on the pin. But the very first Disney pin I remember is from the 1940 movie Pinocchio. In the film, Jiminy Cricket is appointed by the Blue Fairy to be puppet Pinocchio’s conscience. After all, every good human being must have a conscience. As a result of his good works, Jiminy is rewarded with a solid gold badge declaring him an official conscience. Jiminy is also the Disney character who sings the beautiful “When You Wish Upon a Star” in the movie. The song is now the theme for Disney Cruise Line. It is magical to hear the first seven notes of the song’s melody on the huge ship horn.